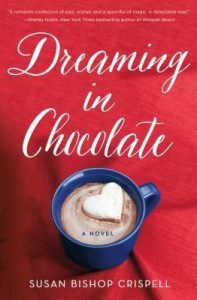 Penelope Dalton inherited a magical table that offers her special chocolate recipes for her chocolate cafe, including the Kismet hot chocolate for the Festival of Fate, a drink that offers townspeople a chance to redirect their fate. It doesn’t work for her little girl Ella, whose illness is fatal. The secret of her father’s identity is harder to contain when he returns to town to assist his injured brother run their bar Rehab. The secret of Ella’s imminent demise spills out of Penelope at a town meeting after she cancels the hot chocolate for the festival. At the same time, Sabine, her mother and business partner, seeks her deceased husband through a chocolaty, magically-induced memory loss. Penelope slowly learns to release her fears and open her heart. The characters in this story are credible in their complex flaws, with good hearts and the best intentions that go awry. Crispell presents a town a bit magical in itself, the residents leaving notes outside Penelope’s home and cafe to get their point across and to show their support and love. Dialogue between the brothers is laugh-out-loud classic sibling repartee—insulting zingers and tough love. There’s a bit much back and forth between Penelope and Ella’s father on the impossibility of a relationship, and she and best friend Megha on his hotness level. The open ending lends itself less to speculation than a call for a realistic resolution. After all, magic has its limitations. Readers who love the every day magic of life in a Sarah Addison Allen or Alice Hoffman story will appreciate Crispell’s work. Meet Susan on her website http://www.susanbishopcrispell.com/, where you will also find links to purchase her wonderful books.